A project like this one begins with a hole in the ground. In this case a big hole that was begun on December 17th, 2009. The remnants of the structure that had stood there had been cleared away during the summer and fall but it was not until December that serious work on the actual building got underway with a drill poking around the lot the jack hammering and by December 21st Chupa Excavation and Trucking was turning the lot into a very big two story deep hole. Every few days I drove by the site and clicked off a picture or two as the work progressed. Most of the work in really unpleasant winter conditions but on the next page you can click through those images and get a feel for the way this project has progressed. 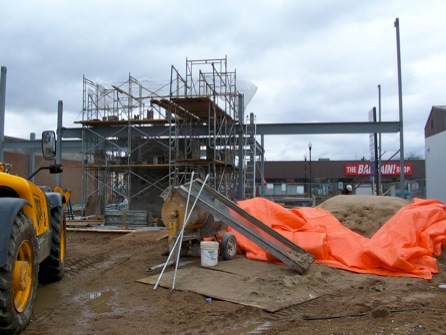 Now (April 14th, 2010) the project is well above ground as work is being carried on as steel goes into place for the second story. Clearly there is much more to go and we will keep on clicking the pictures to see it grow and in due time we will post those images to see how it is going.